[Statute of OCA: Article 5 - The Metropolitan Council] - The Metropolitan Council is the permanent executive body of the Church Administration which exists for the purpose of implementing the decisions of the All-American Council and continuing its work between sessions. 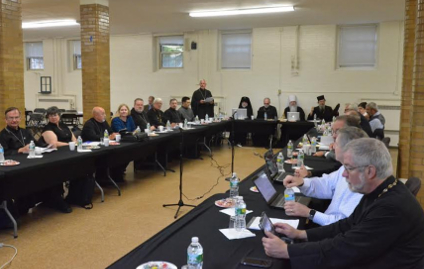 It consists of the Metropolitan as Chairman, the Chancellor, the Secretary, the Treasurer, two representatives from each diocese, one priest and one layman elected by the Diocesan Assemblies, three priests and three laymen elected by the All-American Council. Vacancies occurring among diocesan representatives are filled by the respective dioceses. Two alternates are elected by the All-American Council, one priest and one layman, to fill vacancies occurring among members elected by the All-American Council. All elected members, whether representing the several dioceses or those elected by the All-American Council, succeed themselves in office for one term only.